?Which is both Healthful and Good.? A brewery, as we know it at the present time, is a comparatively modern institution, Boniface, in the good old days, as they are curiously enough misnamed, brewing his own particular liquor with which to regale his guests or speed the traveller on his way. Each Inn had its own brew-house, where in March and October the ?pontoons? would be running over with the ?good old ale,? celebrated in song and verse for its virtues and convivial properties. But ?the old manner changeth, giving place to new.? From motives of economy and utility, brewing became a separate occupation, and from a simple domestic task developed into quite a scientific proceeding. The microscope and the laboratory were in turn called upon, to ascertain the exact properties of the malt, quantities and precise temperatures, mechanical means being also introduced to assist manual labour. Old buildings were found out of touch with the advance of requirements, and then came the modern brewery with its tower, its huge tuns, coppers, fermenting vessels, pumps and pipes, representing a capitalisation of pounds when pence would have sufficed in the old style. Having climbed the hills from Stevenage, and espied the quaint old village of Walkern nestling in the hollow provided by the surrounding high-lands, we can see in imagination the old farm buildings whereat the founder of the Walkern Brewery, the late Mr Samuel Wright, applied his skill in converting the barley grown by farmers in the neighbourhood into sparkling ales and darker coloured beers, which were in the years that followed to found the fortunes of the Walkern Brewery. These converted farm buildings were destroyed by fire, which event called into existence the Brewery as we see it today. 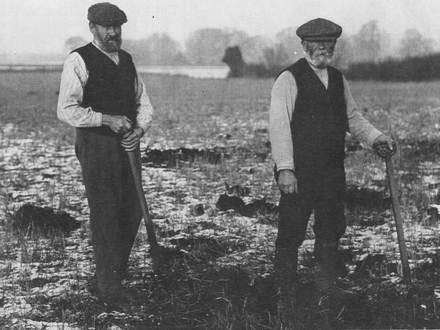 After the death of Mr Samuel Wright, thirty-three years ago, the business was carried on very successfully for many years by the executors, the late Mr J Bullen, with Mr James Holland as Brewer and Manager; and the present proprietors, Messrs S and H Wright, sons of the aforesaid Mr Samuel Wright, very willingly acknowledge their indebtedness to the enterprise mid devotion of these two worthy gentlemen. Though Messrs S Wright & Co. (the title under which the business is now conducted) have modernised their buildings and their procedure, they have not brought ?up to date ? the ingredients from which their ales are brewed. They use nothing but barley, ?long in the stalk, full in the ear,?? and flavour only with hops. This barley is converted into malt in a wing of the buildings at Walkern, and known as the Maltings, which consist of Barley Loft, Steeping cistern, and two Growing Floors, 40ft x 150ft, Drying Kiln and Malt Store. The objects of malting are manifold, producing such mysterious changes in the constituent of the grain that when eventually infused with hot liquor in the mash tun, we get from what was once barley, a sweet malt wort. This malting having been done, and the smaller grains eliminated by means of a ?Boby? or screening machine, the malt as required is conveyed to the brewery proper, and taken to a hopper at the top of the building. Here it is first brushed by machinery to remove all dust and then crushed by passing through steel rollers, whence it is automatically conveyed to the ?grist? case. This latter is situate over a large circular vessel called a mash tun, into which the malt drops through a mashing machine, after having been amalgamated with hot liquor (and for ?liquor? the uninitiated must understand that water is referred to). Further ?liquor? being added, the mixture is allowed to infuse, when it is drawn off through pipes in the base of the mash tun. To keep back the spent grains, however, there are slotted plates, which form a false bottom to the tun, and act as a strainer. So as to extract any remaining ? wort,? this being the technical name of the infusion, copper pipes or sparge arms rotate from the centre of the mash tun, throwing down a fine rain of hot liquor upon the bed of grains. This is known as ?sparging,? and washes out any remaining wort. The wort has now to be boiled, and as it has dropped below the level of the copper, it is pumped up into this receptacle. It is at this stage that the hops are added, which give character to the wort that up to this point is sugars? and insipid. After boiling, the wort and hops drop into a vessel called a hop-back, whence it is drawn, leaving the hops behind. It has now to be cooled as rapidly as possible, to which end it is run on to shallow troughs or coolers, and then over a refrigerator, whence it is conveyed through a pipe into one of several fermenting vats, each of a capacity to hold 1,400 gals. These tuns are fitted with attemperating coils or pipes through which water is driven so as to lower the temperature of the wort , in case fermentation should proceed too rapidly, yeast having first been added. When the fermentative action has ceased, after about five days, and not till then, does the liquor arrive at the distinctive title of ?beer?, when it is dropped from the fermenting vats into a ?? settling back,?? and then racked off into casks. 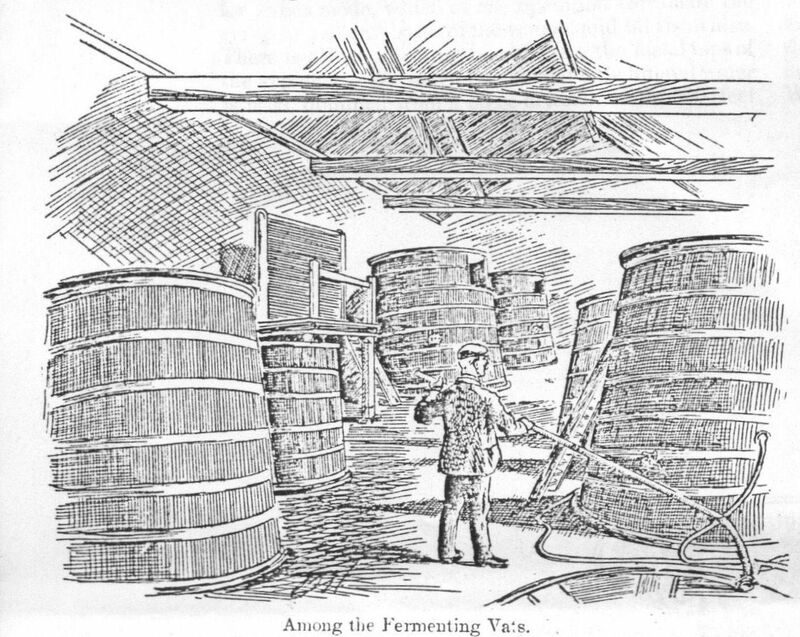 All this is a great elaboration of the old style of brewing, and while allowing of large quantities to be dealt with by Messrs Wright, and so economising the cost of production, it at the same time secures to the public, either through their houses, or the large family trade which they enjoy, a beverage that is both pure and wholesome. There are elaborate arrangements for securing the thorough cleansing of the casks, they being scoured inside and out, and then sterilized by steam at a pressure of 50lbs to the square inch. 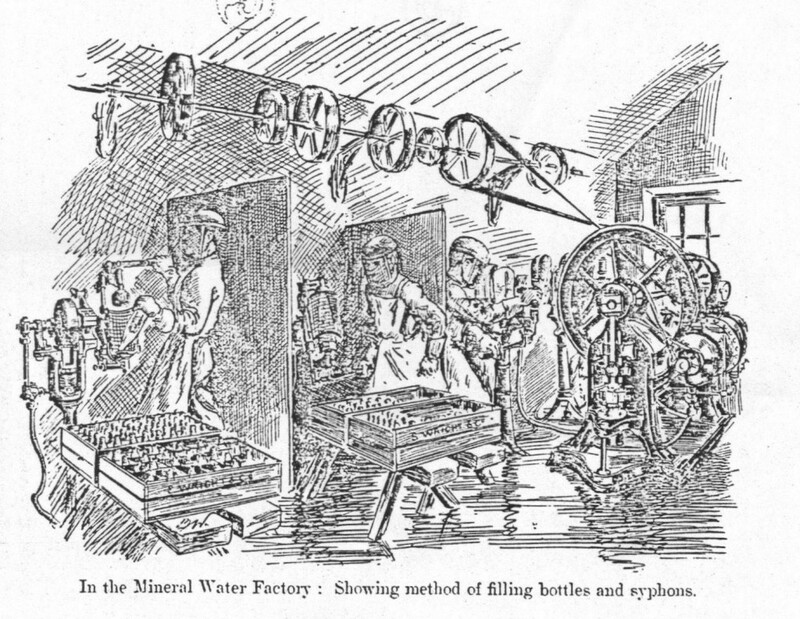 In the bottle-washing department there are spiral brushes worked by power, the bottles being then placed over jets of water. 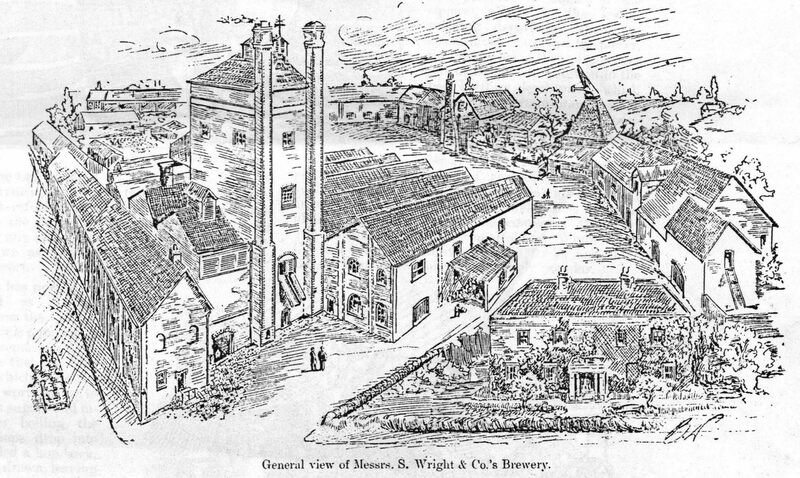 In addition to the beer bottling department, which forms an important branch of the business, by reason of the popularity of the four-quart crates, the Walkern Brewery have also a Mineral Water Factory, where are prepared all descriptions of aerated waters, either syphons or bottles, dry ginger ale being also included in the list. In this way some twelve tons of granulated sugar are used in the course of the year. The manufacture of Non-alcoholic Wines and Cordials is a recent addition to the trade, and their Ginger Wine is becoming increasingly popular. The manufacture of aerated waters is a feature of the business which has grown to considerable importance within recent years, necessitating [a] large plant to cope with the increasing trade. These waters are supplied either in the ordinary glass stoppered bottle, or in syphons, there being several ?filling? machines for either mode, which at one operation carbonate the syrup or mineral bases of the waters, and fill them also. There is also a polishing machine for the metal tops of the syphons. We may observe that only filtered water is used, obtained from a large artesian well, 300 feet deep, sunk in the brewery grounds. Nor does this exhaust the activities of the firm. They hold a very large and varied assortment of well matured Cigars, ranging from the ordinary 2d smokes to the choicest Havanas. The engine house, stables, stores, hop-room and various working-departments, further contribute to the working economy of the business, the brewery in fact being a very important item in the industry of Walkern.